Renowned artist and Tuol Sleng survivor Vann Nath died on Monday 5 September and Hanuman would like to extend their condolences to his close family at this difficult time. 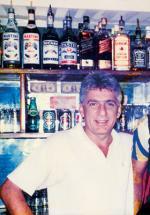 One of Phnom Penh’s most beloved and colourful expatriate residents, Andre Calabro, passed away on Monday after a prolonged bout with cancer. He was 52. Andre, a dutifully irreverent son of Le Midi with a proud Corsican ancestry, ran Le Deauville, the well-known brasserie on the circle at Wat Phnom, which over the last 13 years was a home away from home for many foreigners and Cambodians alike, a place to savour a rich, amber cocktail and catch up on the days events for regulars from all corners of the globe. 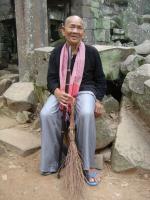 In memory of Nhiem Chun, the Sweeper of Ta Prohm, who sadly passed away earlier this year. He is as much an icon of Angkor as the tangled roots that slowly choke the ancient stones of Ta Prohm. Man first conquered nature to create, nature slowly conquered man to destroy. But Nhiem Chun has dedicated his life to stemming the tide of nature, bent double, stooping low over the stones to sweep away the falling leaves each day.